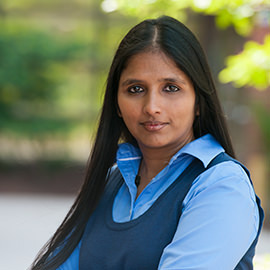 WATERLOO – Shohini Ghose, an award-winning quantum physicist, associate professor and director of the Centre for Women in Science at Wilfrid Laurier University, will be speaking on Laurier’s Waterloo campus May 18 to help mark the 19th anniversary of the Laurier Association for Lifelong Learning (LALL). Ghose will share the recent developments in the study of astronomy and Canada’s contribution to this amazing unfolding story. An educator and internationally acclaimed speaker, Ghose was one of only two Canadians chosen as a 2014 TED Fellow, an honour that included her delivering a TED talk at the international TED2014 conference in Vancouver 2014. Formed in 1997, LALL is a nonprofit organization supported by Laurier’s Office of Continuing Studies that provides a unique learning option for adults. LALL offers six-week courses intended for personal interest or self-education. The May 18 lecture will be held in the Senate & Board Chamber on Laurier’s Waterloo campus and is open to the public. Doors will open at 6:30 p.m., with the lecture scheduled to begin at 7 p.m. Refreshments and hors d’oeuvres will be provided as well as a cash bar. Tickets to the event can be purchased in advance for $5 from the Office of Continuing Studies (202 Regina St. North, Room 294) or at the door for $10 (cash sales only). For more information, visit the LALL website or contact the Laurier Association for Lifelong Learning at 519-884-0710 ext. 4628 or lall@wlu.ca.